Check out my new refrigerator magnets! I got the magnets from a vendor set up right outside the Pizza Hut next to Zhongshan Park. He told me they were 2 RMB each. I knew full well they weren’t worth that, but sometimes you really don’t feel like haggling over a couple RMB. I offered him 5 RMB for all three, which he accepted immediately. “. . . aren’t in Shanghai,” I meant to say! 🙁 Dingshan is obviously in China!!! pretty awesome! Like Da Xiangchang, I’ll have to keep a note of these the next time (soon I wish) I’m in China. That and all the super awesome cheap stuff to be found in the peoples republic . 5 RMB for 3? John, you’re a good bargainee,hehe. So what are they? Enlighten those of us w/ a chineses-food challenged menu. I’m no expert on dim sum, which is why I refrained from naming the different foods. I guess I’ll give it a shot, though. To make things easier, I’ll follow the naming conventions on the Wikipedia dim sum page. You can also find fuller descriptions there. In my fingers is what looks like “Shanghai steamed buns,” although they do seem a bit too big. Maybe they’re supposed to be some other form of baozi, like a pork-filled one, as Illy suggests. It’s the swirl on top that reminds me of the Shanghai steamed buns. Going clockwise, we have what Illy correctly identified as Siu Maai (that spelling, like “dim sum,” reflects the Cantonese pronunciation of the word). 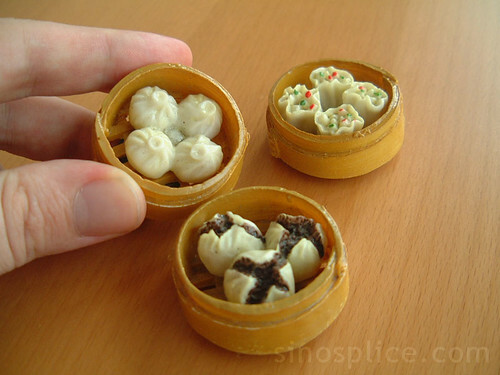 At the bottom is a kind of baozi which at first, I, like Illy, thought was filled with red bean paste. After looking at the leftmost food picture of the three I supplied (which is pork-filled), though, I’m not entirely sure. But then I hate red bean paste and never eat those buns, so I’m not very familiar with them or how their plastic miniature rendition might appear. you don’t like red-bean-paste buns? can i tell you, john? now, i know that with the red-bean-paste bun… you never see that filling peeking out. so, couple this fact with what the tagline for the first thumbnail says… and you gotta know that your third magnet is probably not red bean. because they are so yummy that it’s unholy. john, does your girlfriend know about your not liking this bun? I agree with John; red bean paste stuff is gross. i have to agree — those magnets are VERY cute! and yummy looking! john, as picky as i was about the food i would eat while i was visiting china, i really missed the food when i left (after only 2 weeks). when next i visit, can we try to track down live versions of these tasty-looking morsels?! Xiao long bao, sao mai, and dou sa bao (though the magnet makes it look like sesame). Yes the 2 on the top are cantonese Zhao zi and the one on the bottom is bean bao zi. I ate these alot at a cantonese resturant in Dublin, But cant find them in Dong Bei. I remembered I bargained for 10 magnets for one of my Italian coworkers at the same spot two years ago. It was 1 RMB through my efforts. Last time I visited him, I saw a Semens refrigerator wrapped with all kinds of magnets!!!!!!!shocking……indeed. was the salesman of the vendor disabled? Do you know where I can purchase those dim sum magnets in the U.S.?